Merces is designed around removing the difficulty from tipping. Created with a simple and interactive design, Merces is accessible from the moment you open the app (and now, even from your lock screen). One of the main problems with using a tip calculator "out in the field" is how long the process takes. In the time it normally takes to calculate 22% of the $67.48 bill amount with the $5.57 tax, split between the five of you, you've either missed out on conversation or just feel plain awkward having your phone out for so long. For these instances, Merces offers a customizable "Quick" venue. Quick can be customized just as easily as the other venues, but Quick is designed to appear when you need it. Merces works with your own personal tipping preferences and allows you to set those as what it uses. Along with regular settings, Merces also comes with more advanced and personal settings options under "My Merces". These settings are designed to be user created and specific, allowing you to ensure that everything works according to your tastes. 8.25% is the sales tax rate for some parts of texas. My Merces makes it simple to customize and quicken your usage. For example, by adding your local sales tax rate, Merces will be able to automatically calculate your sales tax based on the subtotal you enter! To get the true, time-saving benefits out of Merces, it's suggested that a few minutes be taken to "set up" the settings (especially the "My Merces" settings) when you download the app. 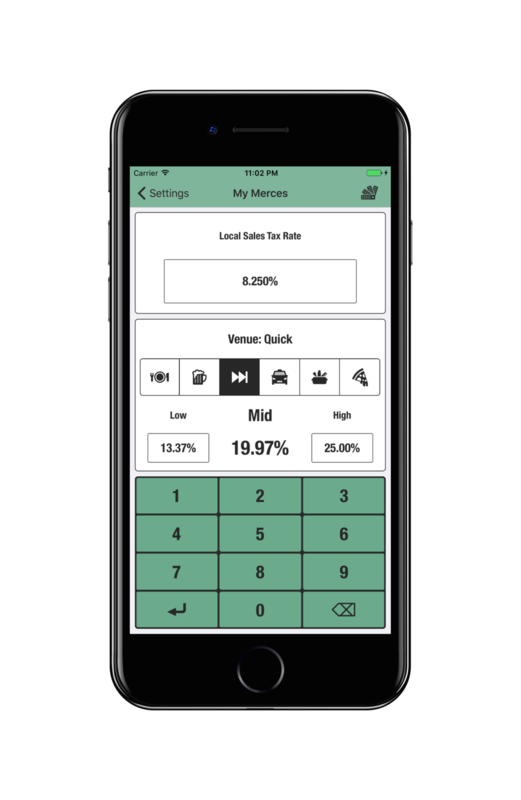 For example, entering your local sales tax rate will make Merces automatically calculate the sales tax on your subtotal for you. This means you'll never have to manually enter or calculate the sales tax on something again! If that sounds enticing, just follow these steps! Still not sold on Merces?